Ah! The joys of trying to work out what is happening at the seabed around the leaking well in the Gulf, and relying on the images from the ROV cameras. 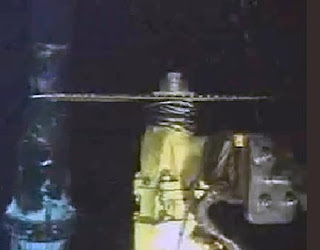 Consider the image that I have just pulled up from the Enterprise ROV 1, which BP has designated as “looking for leaks.” Not wishing to be querulous but that looks suspiciously like a diamond cutting saw in the ROV’s clasp. On that little note of caution, there does seem to be some delay, or perhaps “slow, methodical, unseen progress” in regard to closing the valves etc in order to test the integrity of the well. At roughly 10 pm Eastern, the flow does not appear to have changed much, if at all, and the BP site notes that the test has not yet started. (Nor has it two hours later having finished writing this post). The white pipe is injecting dispersant, that changes the color of the oil/gas to more brown and seems to be coming in spurts rather than regularly at the moment, but this may be because of the changes in the equipment below the leak, which is likely siphoning off a considerable volume from the well. I do note, however that Secretary Chu came down to monitor the test today, and this may have a little impact on the schedules. His involvement in the spill has been continually underlined by the Administration. Secretary Chu is on the phone with his science team a minimum of 1-2 times a day, 7 days a week, and the calls frequently last 90 minutes or more. Secretary Chu and members of his team also have a dialogue with BP executives each morning. • Due to our suggestion, BP used high energy gamma rays to image parts of the internal state of the BOP. Lab personnel have independently analyzed the 2D gamma ray images. That imaging is crucial in helping understand what is happening inside the BOP and informing the approach moving forward. For example, it told engineers which valves and rams inside the BOP were closed and which were open, and it showed that a piece of drill pipe was stuck inside the BOP. Trying to determine what was wrong with the BOP without this information is akin to determining why your car has stopped running if you have no working gauges and can't open the hood. • They strongly encouraged BP to collect additional pressure measurements, which were very valuable in interpreting the behavior of the well and BOP after each top kill and/or junk shot attempt, and ultimately those measurements helped the government and BP determine that the top kill was not going to work and that it was time to move on. The measurements also showed that the top kill attempts did not significantly erode the BOP. • During the top kill attempts, the team suggested rechecking all of the hydraulics on the BOP, which BP did. As a result, one of the pipe ram valves closed more tightly and provided more resistance to the flow. • The team conducted an extensive suite of structural analyses to assess the stability of the riser system in support of the choke and kill series. • The team conducted an independent set of analyses to explain the oil and mud flow during the choke and kill series. This provided an understanding of the operational limits of the containment system going forward. The list does not, however, appear to have been updated since June 15th. Both the Helix Producer and the Q4000 collection systems are currently on line with the potential to exceed the containment capability that existed before the sealing cap was installed, and skimmers continue to be surged to the well site in anticipation of any increased oil flow as part of the transition. The drilling of relief wells also continues- the first relief has been drilled to a depth of 17,840 feet below the Gulf surface, and the second to a depth of approximately 15,963 feet below the surface." The time of the more than 200 scientists and engineers that the Secretary has involved in these decisions is no doubt a part of the $99.7 million bill that the Administration presented to BP today. BP have already paid previous bills totaling $122.3 million to the Administration. In today’s briefing the Admiral noted that the seismic run that was carried out this morning was to provide a baseline measurement of the seabed condition before the pressurization test of the well casing occurred. 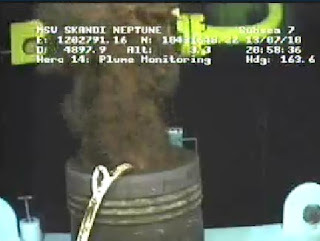 It also had to be carried out in daylight, since the vessel running the sensors had to steam through the fleet assembled around the well, and the sensors also were likely to be degraded by too much adjacent noise as they ran the scan. When we get ready to start the well integrity test, we will first cease production through the Q4000 and the Helix Producer I. We will then divert all the hydrocarbons up into the new capping stack. Valves through the kill and the choke lines for the new capping stack will be opened. And the center bore is already open. So we will be venting basically through three different exits on the capping stack, the kill line and the choke line, and the main line going through the bore. Once the well is shut in then the pressure at the BOP (which is monitored by transducers and not the visible gages) should rise to between 8 and 9,000 psi (which Admiral Allen, a long time ago, had said was monitored just downstream of the BOP at the start of remediation). This is the anticipated value when the weight of the oil/gas column is subtracted from the pressure in the bottom of the well. Anything less than this will indicate that there may be some problems within the body of the well. 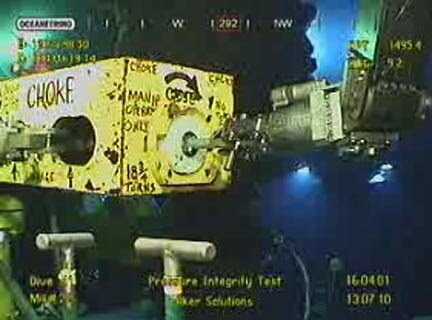 Incidentally the gages that the ROVs are monitoring are monitoring pressures in the accumulator lines that run the hydraulics of the rams and power tools. Development Driller III is now at 17,840 feet measured depth. They’ve been there for a day or two. They are doing testing to make sure they have the right angle of attack as they close in for the last 60 or 70 feet before they’ll actually try and make the penetration for the relief well. The Admiral noted that they are on pace to have 1,000 skimmers along the coast by the end of the month, and that they are using 2 million tyvek suits a month (the suits worn in cleaning the beaches) and there is a growing concern about the national supply of these. The kill line will then be closed as well. Now remember this is either open or shut. That will leave the choke line of the capping stack as a last way for hydrocarbons to exit from the capping stack. And that is set up with a specially designed engineered and built, you’ll be able to see it on the video. It’s a horizontal, yellow piece of equipment that has a pipe that curves up where the hydrocarbons would exit and at the other end there’s a place to insert a tool with a remotely operated vehicle and then slowly close the valve, which we will do that while we are taking pressure readings. This is the control panel he was talking about, taken at 5 pm Eastern. First in terms of the capping stack, last night at 6:20 pm we actually landed the stack on top of the transition spool. By 7:00 we had it fully connected and sealed on top of that device. And then at 8:30 we actually disconnected the drill pipe from the drill ship enterprise from it and so it was in place and free standing at that point in time. The first relief well is at 17,840 feet. Right now we’re running another survey to confirm the distance from the Macondo well, the direction from the Macondo well and the inclination of it. We only have another 30 feet to drill before our final casing point and so we want to make sure that this well is perfectly lined up. So that’s why we’re doing this confirmation run. We’ll do that then we’ll trip back in the hole and we’ll drill that final 30 feet. Then we’ll come back in and what we call open up the hole to make it large enough to run the casing and most likely we’ll be running casing in the hall on Sunday, but of course there can be variability to that. But what I would say is that we’re on track and I’m still looking for the most likely intercept of the Macondo well being at the end of July. So the inclination we’re looking for at the bottom is somewhere in the range of two to two and a half degrees and we think we’re in that range, we just want to confirm that. And that lines us up as we then – after we set the casing I’ll come back and talk about that in a second. We’ll have about 100 to 150, 200 feet to drill to intersect and that two degree angle allows us to do that in that period of time. So that’s why we want that particular angle. However, as I pointed out at the start of this post (and as still holds true) the integrity test has yet to be initiated.